For the millennial generation, the decision to live out one’s dreams often hits a roadblock when faced with the need to survive. Many of us grew up with parents and role models who we witnessed adhering to the previous mantra of going to school, carving out a career and remaining loyal to that profession for the remainder of their lives. However, we’ve also been fortunate to come of age during a time where the internet and technology have grown exponentially to the point of equipping us with more tools to feed our creative imaginations. Upon graduating from high school, many millennials found ourselves in college dedicating our days to proving that we can go to class, complete assignments, find a discipline and earn a degree. During these collegiate years and the few years of “adulting” that follow, it’s common for us to find ourselves at the beginning stages of drafting our dreams while also readying ourselves for the real world to come. Over the past few years, Brandon Miller and Simone Moreland landed in the same bucket that many corporate creatives have also shared. An IT consultant during the day, Miller learned how to balance the duties of a demanding corporate gig with his desire to pursue his entrepreneurial passions -- leading him to start two nonprofits: The Black Burdell and Too Fly Foundation, as well as his branding and motivation agency, Be Great Brand. A jack of all trades in her own right, Simone Moreland has heavily assisted in her family’s business which is now projected to gross million dollar figures. Personally, she’s been involved with investment trading groups, which earn her quarterly installments with minimal time investment. She finds pride in the fact that she’s established passive income through multiple streams and purchased her own home by the time she was 21-years-old. Previously, she has also conducted her own #Mindshift interview series, an effort which laid the foundation for the duo’s book to follow after. There are numerous reasons millennials especially say they haven’t taken the steps towards fulfilling their dreams. For some, there’s a lack of financial security that seems too risky to embark upon. For others, it’s the dilemma of being able to excel at multiple things to the point of being unsure of which niche to make your prominent endeavor. However, many millennials come to admit that the main thing stopping them from following their dreams is the person they see in the mirror every day. After Miller and Moreland realized this truth, they decided to team together to unify the voices of millennial entrepreneurs across the nation in order to equip the masses with the inspiration, advice, and lessons needed to create their reality and live on their own terms. No matter what industry you’re in, The Intersection: Shifting into Greatness provides an authentic entry into the lives of 30+ entrepreneurs who are no different than you. The read serves as a positive reminder of how powerful and innovative young, black minds can be when they become laser-focused on achieving their goals and destroying distractions. For the aspiring actor, Michael Oloyode’s excerpt can be the story you need to push yourself out of the office and onto the stage. Originally from Atlanta, the New York City resident has gone from working in the advertising and marketing field of fashion companies to filling his days with rehearsals and auditions for various plays and films to add to his budding portfolio. Most recognized for his role as Blue on BET web series “Brooklyn. Blue. Sky.”, he now dedicates nearly 10-12 hours of his day to sharpening his craft in anticipation of what opportunities are to come. In what could be considered an overpopulated market, he finds peace in knowing that he’s living life the way that he wants to while paving the way for others to follow in their pursuits as well. Speaking of peace, yoga and mindfulness instructor Amanda Muhammad seeks to teach others how to implement positive self-care and stress management practices through her blog and membership site, Mako Mindfulness. Based in the Dallas-Fort Worth area, Muhammad’s story can relate to that of many millennials who find themselves succeeding in the corporate world but failing at finding fulfillment in their careers. Also the co-owner of A Peace of Yoga, her interview goes on to highlight how she finds power in the art of saying no while simultaneously emphasizing the need for millennial entrepreneurs to invest more in their need for personal time instead of overcommitting to any and everything. While Amanda practices peaceful methods, fellow entrepreneur Paul Dykes quit his job on Wall Street in favor of promoting the party with his travel company, Haywire Weekend. Originally from Tuscaloosa, Alabama, his outlook on life motivates millennials to remove doubt from our mindsets, serve as our own cheerleaders, and believe in the full manifestation of our businesses. Believing in his purpose to put smiles on people’s faces, he’s orchestrated luxurious trips to locations including St. Lucia, Puerto Vallarta, and Turks & Caicos where young professionals of all industries celebrate their collective successes during “the best weekend of their life.” With upcoming trips to the Hamptons, Greece, and Bali, he intends to keep his foot on the gas in order to encourage millennials everywhere to pursue their dreams full-throttle instead of on half a tank. A recent college graduate, Auriel Oates began cultivating her entrepreneurial space while still in school. 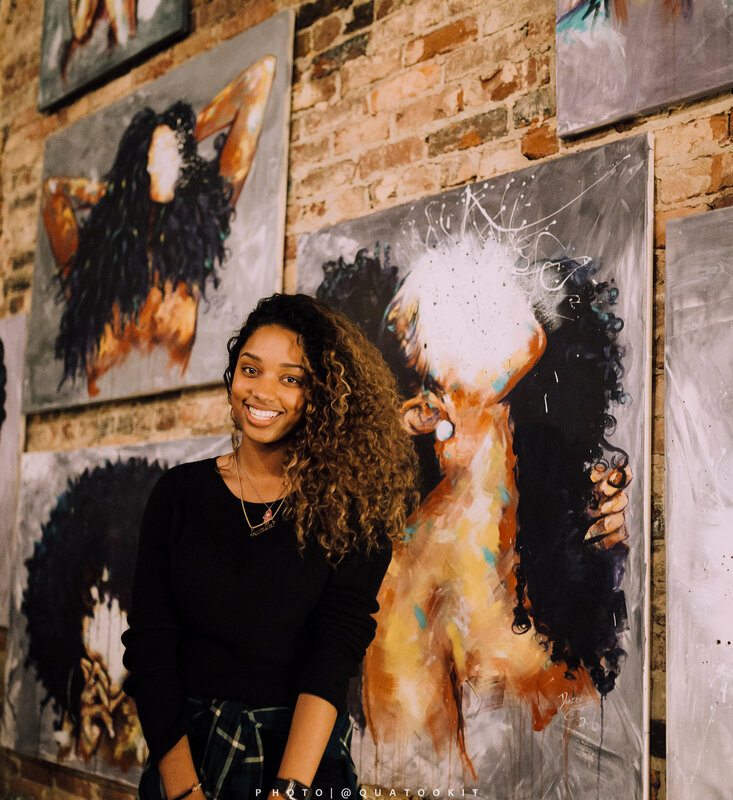 As founder of “The Art of Metanoia,” she spearheads a brand experience dedicated to curating events that provide a platform for creatives of all kinds to showcase their art to the masses. Since the brand’s first event in June 2016, her functions have gone on to boast an average attendance of over 300 people within the metro-Atlanta community. An avid lover of Ted Talks and self-help books, Oates recognized that the best decision she made was letting go of the tendency to worry and choosing to trust the timeline that the universe has in store for her. While continuing to bolster her brand throughout the city of Atlanta, she’ll also be expanding her creative community to New York’s Lower East Side with her next event on Saturday, August 4th. In addition to the aforementioned entrepreneurs, the book features numerous other ambitious individuals who have decided to face their intersection head on instead of diverting from the path called upon them. With a hip twist to its storytelling, you’ll be able to apply tangible action steps to your life after learning from lessons provided by culinary professionals, public speakers, tech experts, travel enthusiasts, and media mavens. Furthermore, the book and its accompanying journal teach millennial moguls in the making how to build their brand, optimize efficiency, leverage relationships, debunk entrepreneurial myths, and pay it forward. When reflecting on the driving reasons behind creating the book, Miller stated, "Nothing great is ever achieved alone. There are plenty of brands that deliver from a personal perspective but "The Intersection" is about us. We’re celebrating each other because if we don’t, who will?" As the wave of Entrepreneurship continues to make splashes in various industries, take it upon yourself to add this book to your collection so you can dive into your destiny, pour into your passion, and identify your intersection.